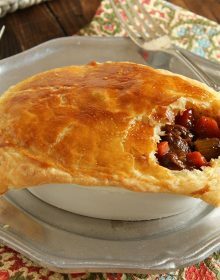 Individual Guinness Beef Pot Pies are the ultimate comfort food! In a large bowl, toss the beef with the flour to coat evenly. Heat 1 tablespoon of the olive oil in a large dutch oven over med-high heat and add some of the beef cubes. Working in batches, brown the beef on all sides and then transfer to a bowl using a slotted spoon. Set aside. Drain off all but 1 tablespoon of fat from the dutch oven and add the remaining olive oil to the pot. Add the onions and cook until translucent. Stir in the carrots and celery, cooking until just tender. Add the tomato paste and cook until a deep burgundy color. Add the stock, beer, worcestershire, rosemary, thyme, parsley, bay leaves, 1 teaspoon kosher salt and 1 teaspoon fresh ground pepper stirring to combine. Add the beef back to the pot. Divide the stew among 6 individual oven-proof bowls. Cut the puff pastry sheets into 8 equal pieces (yes, you will have two leftover). Lightly moistened the top of the bowl with a little water and place the puff pastry on top. Press down on the edges slightly to form a seal. Brush the top of the pastry with the egg wash. Repeat with the remaining bowls. Bake in a 400 degree oven for 20-25 minutes or until the pastry is a deep golden brown and crispy. Serve immediately.